Trane, Carrier and Lennox are the “Big 3” of the HVAC world. Their large market shares are fueled by quality, efficient products and huge marketing budgets. They all make our Best Brands list for this year. While there are plenty of similarities, there are also distinct differences in the brands, and this guide points them out, so your buying options will be clear. This Guide’s Purpose: Buying a new furnace is a decision you’ll potentially live with for decades and it can be a daunting proposition. This guide explains many of the features you’ll base your decision on. An informed homeowner will always be happier with their decision, so that’s our goal. Pros Perspective: This guide offers insight from HVAC installers and repair technicians that work with these brands every day. We stay away from input that is clearly biased, such as from dealers that sell only one of the brands. Instead, we quote pros that sell at least two of the brands and work on all three. Here’s a navigation guide to show you where we’re going and allow you to jump to sections that interest you. Trane doesn’t use series names, but does offer a similar range of furnaces. 80% efficient furnaces: Models are offered in single-stage and two-stage versions. 90%-plus furnaces: High-efficiency furnaces are produced in models from 90% to more than 97% efficient. Single-stage, two-stage and variable-capacity furnaces in this range are made by all three brands. Now, let’s begin to distinguish these three brands for their differences that range from minor to significant. We review Efficiency, Variable-capacity Heating, Features, Heat Exchangers, Warranty, Repair Record and Price. Lennox has been the brand most committed to energy efficiency for a decade. It’s once-clear advantage has shrunk though, as the other two brands have improved efficiency in their top furnaces recently. The differences are small. There’s only 2% between these. If your winter heating costs for the top Lennox model were $800, they would be $816 for the least efficient Carrier or Trane furnace among those in this list. All make variable-capacity, two-stage and single-stage furnaces, explained in Features, if you’re not familiar with staged heating. This table shows the top models at each level. The bottom line is that efficiency is not the biggest difference among these titans of the HVAC industry. All the brands make several 80% furnaces and a range of furnaces above 90% efficiency. We’ve noted that these brands make variable-capacity furnaces. They use modulating gas valves for this purpose. Similar to cruise control, the gas valve receives input from the thermostat and modulates up and down as needed to maintain precisely balanced temperature in your home. Lennox SLP98V: Varies between 35% and 100% in 1% increments. Trane XC95m: Varies between 40% and 100% capacity in 1% increments. Carrier 59MN7: Also known as the Carrier Infinity 98 furnace with Greenspeed Intelligence, it modulates between 40% and 100% capacity in 1% increments. The Lennox furnace running at a low of 35% is slightly quieter than the two 40% furnaces, but this is a tiny difference most will not notice. The comfort factor is equal for all three models. Is upgrading to a variable-capacity furnace worth the extra 20% to 33% cost? If your goal is to reduce energy use and cost as much as possible, then it is worth it. This table shows top features available, what they are called by each brand and, in some cases, what models they’re available on. Humidity Control: With humidity control, the fan runs at low speed after the air conditioner compressor has turned off. This continues to move humid air over the coil while the coil is still cold. Moisture condenses on the coil and is drained away. Cool, dry air feels more comfortable than cool, damp air. These systems also work to add humidity to the air when in heat mode using an integrated humidifier. Variable fan: The primary benefit of a variable-speed fan is that it starts and ends on slow speed, so that you don’t feel cold air blowing before the furnace has heated up and after the burner has shut off and the fan is moving out the rest of the warm air. It also matches the capacity of the burner (low or high for two-stage heating or modulating for variable-capacity). Smart thermostats: These are WiFi thermostats with matching apps available for Android and iOS from your favorite app store. They allow you to monitor and control all HVAC system functions from a smart device. For example, if you leave home and forget to turn down the thermostat, just connect via the app, and make the adjustment. Turn the system back up when you’re on the way home. WiFi: Carrier excels here. While only top Trane and Lennox Signature models are compatible with WiFi thermostats, all Carrier furnaces can be controlled by a WiFi thermostat. Smart home: Home automation technology is growing. Expect all these brands to work with a growing number of smart home systems. For now, these are the systems and devices these brands are compatible with. Communicating technology: Standard thermostats signal the furnace when to turn on and off. The signal is one-way communication. Communicating thermostats get feedback from the furnace and air conditioner that makes heating and AC more precise. Communicating technology is an upgrade for $1,000 to $1,500 or more for a complete split system. The components must be wired for communication, and a communicating thermostat must be installed. see our guide to Communicating vs. Non-communicating technology for pros, cons and our recommendation of whether it is worth the money. Every furnace has a primary heat exchanger. It is a system of tubing that the combustion gases pass through on their way out the flue. The furnace pulls cold air in, and it is heated as it passes over the heat exchanger tubing. Condensing furnaces have secondary heat exchangers that transfer additional heat into the circulating air. When combustion gas passes through the secondary heat exchanger, it cools to the point of condensing into water and carbon dioxide, a mix that produces corrosive carbonic acid. For this reason, secondary heat exchangers must be resistant to corrosion. Trane, Lennox and Carrier use similar heat exchangers. All their primary heat exchangers are made from aluminized steel. Their secondary heat exchangers are stainless steel. There’s no clear winner in comparing Trane, Carrier and Lennox heat exchangers. Trane and Carrier warranties are very similar. In our opinion, they are also better than Lennox warranties for most models. The one benefit of a Lennox warranty is that you won’t have coverage reduced if you forget to register your furnace in the required time. Every furnace is covered by two warranties, a general parts warranty and a heat exchanger warranty. There is no labor for warranty. This table shows differences in Carrier vs Trane vs Lennox warranties. What Carrier says in its warranty applies to Trane and Lennox to. Under the heading “This Warranty Does Not Cover,” Carrier says, “Labor or other costs incurred for diagnosing, repairing, removing, installing, shipping, servicing or handling of either defective parts, or replacement parts, or new units.” In short, Carrier supplies a replacement part. You pay for everything else. 1). Registration: Within 60 days, or the warranty will be reduced to 20 years on heat exchangers and 5 years on other functional parts. 2). Transfer: If you want the warranty to be transferable, you must purchase the option. Currently, it costs $59 if transferability is purchased in the first 60 days. Otherwise, it can be purchased for $99 during the duration of the warranty and up to 90 days after you sell your home. The length of the warranty is not reduced. 1). Registration: Within 90 days, or the general parts warranty is reduced from 10 years to 5. If the unit has a secondary heat exchanger, its warranty coverage is reduced from lifetime to 20 years. 2). Transfer: If you sell your home, the warranty transfers but at the reduced lengths – 5 years for parts, 20 years for the secondary heat exchanger. The primary heat exchanger coverage remains 20 years. 1). Registration: No registration is required, but you must keep a proof of purchase receipt. 2). Transfer: The basic warranty is not transferable. Extended warranties are available at significant cost, and they are transferable. Warranty reductions for failure to register a warranty of any kind are not lawful in California. We still recommend registering your furnace or HVAC system for the fastest possible repairs with the least amount of hassle. Warranties are voided for the following: Furnaces bought online or at auction. Furnaces not installed by a certified HVAC technician. Improper installation by any person. The failure caused by the installation of unauthorized parts. Warranties do not cover: Damage caused by weather, lightning or flooding. Trane, Carrier and Lennox offer extended warranties. Some include labor coverage. They are provided by a third party, not Trane, Lennox or Carrier. Extended warranties are expensive. Prices range from $250 for basic coverage on a cheap furnace to more than $1,700 for full coverage on a high-end furnace. Most homeowners will be better served putting away the money spent on the warranty for maintenance and potential future repairs. Some extended warranties require that you have a maintenance plan with a heating and cooling company. We think regular maintenance of a furnace for cleaning and minor repairs that can delay major repairs should be done every 3-5 years. Maintenance plans require annual maintenance, and that is usually money wasted. The warranties contain a range of loopholes that allow the companies to deny your claim. Like insurance of any kind, the insurer makes money by paying out less in claims than they take in for the cost of the coverage. Extended warranties are great…for the people that sell them, but not for the consumer. The residential HVAC industry is very competitive. Quality: All the leading brands, including Trane, Lennox and Carrier, have fully examined one another’s technology and part’s quality. Each has taken apart the others’ furnaces, tested them and used the information to upgrade their own technology where possible. The biggest issue is installation, and there are major differences there. More on that point later. Parts and Prices: Carrier, Lennox and Trane furnaces break down at rates within a few percentage points of each other. The cost of the repair parts and how long it takes to make the repair (in the middle of a winter’s worst weather) is what makes the difference. Here’s the inside scoop on repairs for these brands. First, all furnace brands use some parts manufactured by third parties. They are built to Trane, Lennox or Carrier specs and quality requirements, and they are more readily available than OEM parts. The extent to which these universal or generic parts are used by the brands makes a difference in repair costs and repair times. Trane: You will pay more for Trane repairs in some areas. Some local wholesale parts distributors stock mostly Trane-manufactured parts rather than generic parts. In metropolitan areas, there are competing wholesalers that sell cheaper parts, so this isn’t an issue. In rural areas with only one parts seller, it can make a difference. Lennox: The biggest problem with Lennox has been that many common repairs have required Lennox-brand parts. The company also had supply chain issues, so waits for parts of more than a week were not uncommon. As we discuss in our Trane vs Carrier vs Lennox Central AC post, Lennox claims it has been improving its supply chain fulfillment times since 2015. Carrier: Parts are widely available and affordable. Carrier has a clear advantage over Lennox and Trane in this category. The brands compete on quality, and just as fiercely on price. Our guides to Trane, Lennox and Carrier furnaces have detailed pricing information for furnaces and for installation. As new models are introduced every year or two, pricing changes. Trane and Carrier are priced slightly higher (less than 5%) than Lennox. Across the board, Lennox has slightly higher efficiency ratings. On the downside, Lennox has parts issues, as we’ve discussed. Only consider contractors that sell more than one brand, so they are not “pushing” their only brand of furnaces. Get estimates from several contractors in your area that are licensed, insured and have a good track record with homeowners. Let them know they are competing for the work, and if they want the job, they will provide their best estimates. Reject bids that are much lower (they are cutting corners) or much higher (they are price-gouging) than the others. The two most common places to find product reviews are on the manufacturer’s site and on independent review sites. Manufacturer sites: Reviews on Trane, Lennox and Carrier sites are unreliably high. The homeowner just had their furnace installed, the house is warm and cozy, and the furnace is quiet. If a utility bill cycle has passed, their energy cost is lower. They are enthusiastic about giving the furnace a high rating. Independent review sites: Independent sites are places homeowners go when they have had a bad experience a few years after the furnace is installed. These sites are overwhelmingly negative toward ALL brands. Studies show that unhappy customers voice their opinions six to eight times more often than satisfied consumers, and that skews the data. As is often the case, reality is in between. 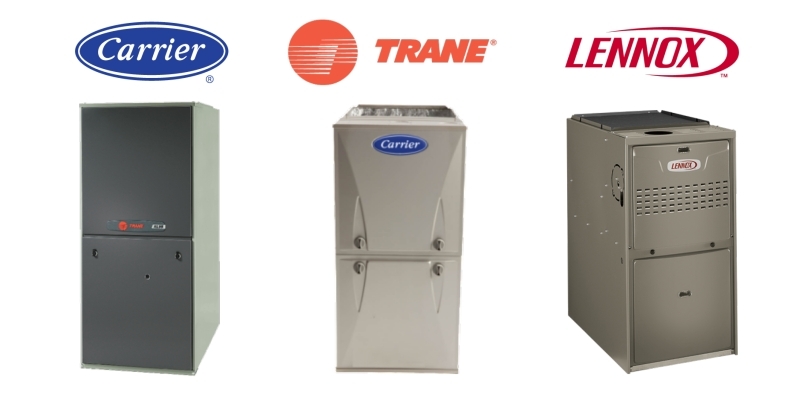 Trane, Carrier and Lennox are all in the top half of furnace brands for quality, reliability and features. While the jury is still out on whether Lennox has fixed its supply chain issues, these three brands are more similar in major areas than they are different. It will surprise some homeowners to know that installation is a more reliable indicator of whether a furnace will run durably that what brand it is. Studies like the one done by the National Institute of Standards and Technology demonstrate this. Get estimates from several contractors that sell multiple brands. Reject bids that are 15% below or above the average of the bids you receive. Don’t get talked into an extended warranty, but instead put the money away to cover potential future maintenance and repairs. Have your furnace and entire HVAC system maintained every 2 years (heavy use) to 5 years (light use) to keep it running at optimum efficiency and performance and potentially prevent major repairs that can happen during extreme cold or heat. When you request Free Local Quotes from our website, you’ll receive no-obligation quotes from licensed and insured HVAC installers certified by Trane, Carrier and Lennox to install their equipment in your area.